I served, a few years back, on a jury panel and it was an extremely exciting experience. The process was efficient, the lawyers were dynamic, and the judge was pretty funny. And, to top it all off, former controversial Dodger Milton Bradley was among the potential jurors. He wasn’t selected, but he and the other mentioned factors made my one and a half week service an enjoyable one. I might be in the minority, but I wouldn’t mind being one of the twelve again. The case: an attempted murder trial. I was one of two pastors selected to serve, so naturally (or supernaturally) we connected well. We talked ministry during our breaks and we shared some of the things our respective churches were doing for the community. For some reason, however, our ministry conversations became competitive in nature, as if we were trying to one up each other on who was doing more for the Kingdom. And then our already short connection became even shorter. I smiled. I shrugged. And we never talked again. we’d rather die over doctrines than build authentic inclusive community that looks to explore the realities of Jesus. This is ultimately why Jesus came. He didn’t come to convert people. He came to rescue His family. Jesus came to restore what was broken when the original sin was committed. He came to break down the barrier between us and God that sin created. Unfortunately, we build this wall back up every time we choose to view people as prizes we win, rather than people to love. In other words, Jesus came to show who He was for. Hugh Halter does a great job at painting this picture in the book; a picture of godly love, rather than religious condemnation. Hugh uses stories from his own life where he engages with the “non-believing” world and shows them a love that transcends religion. The stories Hugh uses, much like those in his previous books, are far from candy coated. The stories Hugh shares are a definite reflection of him meeting the incarnate God and him wanting to show others what the incarnation looks like in their own lives. They’re raw. They’re real. They’re really good. 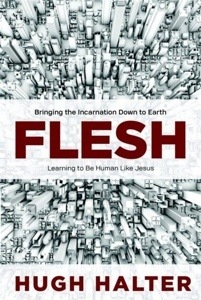 “Flesh” is a great read for both believers and non-believers. It challenges the religious quo with the possibility of offending many Christians and it’s encouraging even for the person with the hardest of hearts toward religion.